If you have a car with 4L60E transmission problems, you will have several options to address the issues. One way is to take it to a dealer and pay an arm and a leg. The other is to fix the problem yourself. One way to do this is by buying transmission rebuild kits. These kits come with everything you need to fix your 4L60E transmission. 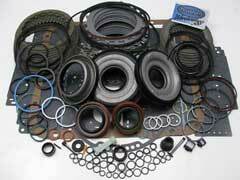 Some of the parts included are gasket and seal kit, clutches and a drain plug kit. Additionally, many stores will have instruction sheets to assist you throughout the process of rebuilding your 4L60E transmission. Before undertaking your overhaul, you may question whether the kits are a good idea. Here are several reasons why buying them makes this an easier process for you. For starters, many of the kits have everything you need to overhaul your 4L60E transmission. This means you don’t have to spend time shopping around for each part as this is a packaged deal. Further, you won’t have to worry about accidentally buying a part for say a 4L80E transmission, as everything in the package goes with the one unit. Next, the quality of the parts in these kits is top of the line. This means you’ll be receiving the best possible equipment for your vehicle, which will add durability and dependability over the long haul. Along with convenience and quality, many of these packages are affordable thereby providing you everything you need to rebuild your 4L60E transmission while not breaking the bank. When factored altogether, these kits are a great way for you to do a 4L60E transmission rebuild. For the quality of the parts, affordable cost and easy shopping, this gives you more time to focus on rebuilding your transmission. Furthermore, you can have peace of mind in knowing what you buy will be dependable and hold up over time. To buy kits, you can visit your local auto parts store. You can also go shopping online with retailers like Summit Racing Equipment. Along with finding parts, many of these websites have excellent resources and tips on how to rebuild your transmission.